This walk begins in the pretty town of Sierre and follows the valley to Zinal stopping in alpine villages along the way before returning via Vercorin to Sierre – all the time surrounded by magnificent snow-capped peaks. The beautiful Anniviers Valley is situated on the River Rhone’s left bank in the middle of the French speaking Canton of Valais. The area’s natural beauty ranges from the untamed River Rhone itself, up the slopes of the planted vines and sunny hillsides with their vineyard panoramas to the Nature Reserves, deep gorges and the lofty snow-capped mountains above. The walk begins in the pretty town of Sierre and follows the valley to Zinal stopping in alpine villages along the way before returning via Vercorin to Sierre – all the time surrounded by magnificent snow-capped peaks. hiking map of the Val d’Anniviers. Vouchers for 2 bus journeys. Not Included: Transportation to/from Sierre, drinks and personal expenses. Day 1: Arrive and overnight in the picturesque town of Sierre/Salgesch, city of the sun! If you have time you may decide to follow the wine trail, from the Villa Chateau in Sierre to the Wine Museum in Salgesch. Along the way special boards provide information on cultivation and the different varieties of grape such as Amigne, Arvine, Chasselas, Humagne, and Pinot Noir; or you may prefer to save the walk for the last day when you return to Sierre. Day 2: Sierre – St Luc: A short local bus journey takes you to the famous Porchet trail up to Chandolin, nestling on the south-west slope of the Illhorn at 2000m altitude. Continue to St Luc at the foot of the Bella Tola. Overnight St Luc. Day 3: St Luc – Zinal: Walk along the second part of the Sierre/Zinal route passing the beautifully situated Hotel Weisshorn to the head of the Navizence Valley – this is the departure point throughout the year for climbers seeking to conquer the Valais 4000m summits. Overnight Zinal. 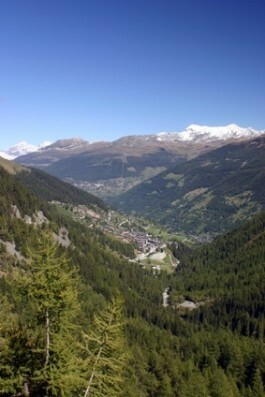 Day 4: Zinal – Grimentz: As you walk to the Corne de Sorebois you get unique views over the whole valley. When you reach the Moiry Dam you will discover the true significance of the name ‘Anniviers’, which comes from the latin ‘adnivers’ meaning ‘towards the snow’. 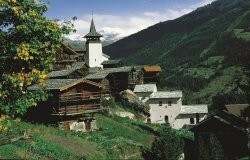 Overnight in the pretty village of Grimentz famous in the area for its typical architecture. 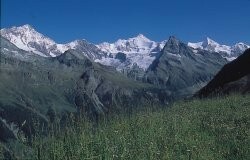 Day 5: Grimentz – Vercorin: Vercorin looks like an eagle’s eyrie perched on the left slope of the Valaisan Alps. It offers a magnificent view across the valley to the Rhone, over vineyards, forests, pastures and finally taking in the impressive panorama of the Bernese alpine chain. Day 6: Vercorin – Sierre: Enjoy the welcome shade of the forests on the north-facing slopes as you return to Sierre, the city of the sun. Overnight Sierre / Salgesch. Suggested Extras: We can arrange for extra nights anywhere along the route with suggestedwalks from many places. For example in Vercorin it is possible to spend an extra day and take the cable car to Crêt du Midi (2336m). From here you can walk along the beautiful “Vallon de Réchy” back to Vercorin.